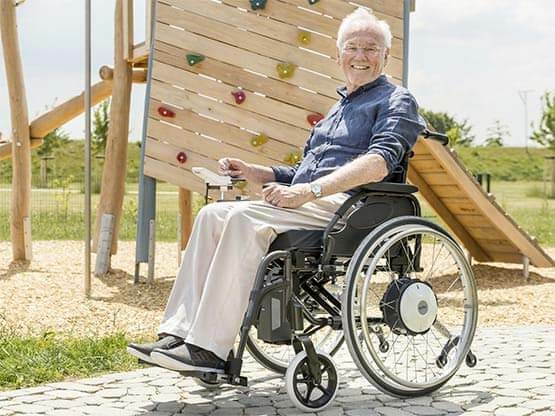 The E-Fix is the electrical add-on drive for your wheelchair! Cover longer distances quickly and easily. The conversion is very easy. Just swap the drive wheels and install the battery pack and control unit – That’s it! The motors are neatly concealed within the wheel hubs. 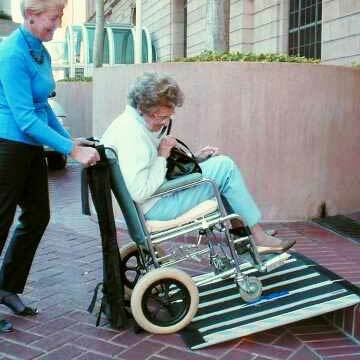 Almost all current types of wheelchair can be retrofitted with e-fix in this way. 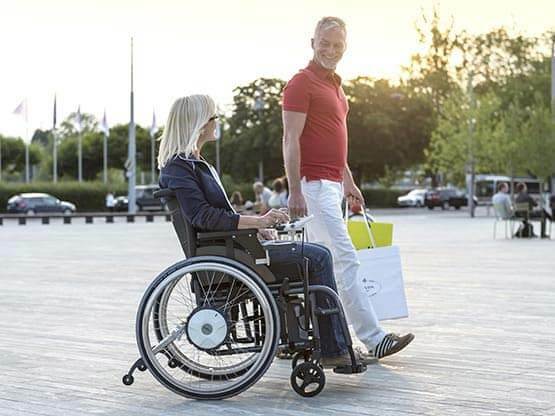 This means that you can continue to use a wheelchair that has been optimally adjusted to suit you. With the big plus of considerably more mobility, the powerful e-fix can handle ramps and gradients of up to 20%* with no trouble at all. The fully charged battery provides a range of around 30km**. 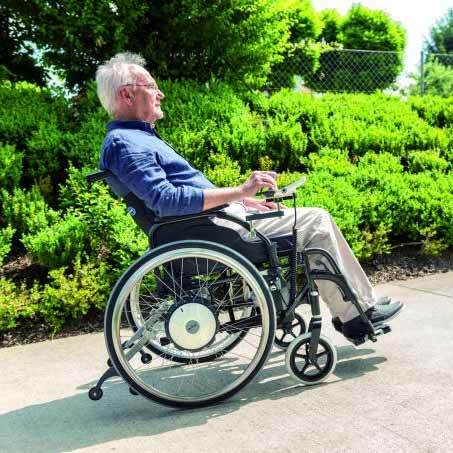 * Depending on the type of wheelchair, weight of the occupant, type of ground, wheelbase and the center of gravity of the wheelchair. ** With the optionally available 22Ah battery pack. 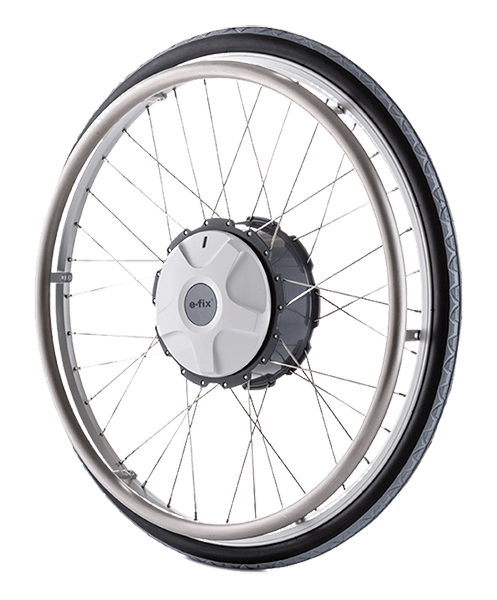 Turn your manual wheelchair into a compact electric wheelchair with the e-fix add-on drive. The drive can be individually programmed and can therefore be adapted perfectly to your personal needs. The electric add-on drive is the simple way to increase your freedom of movement. The e-fix also allows you to cover greater distances and handle slopes effortlessly. Getting out and about and enjoying daily life is second nature to most people. 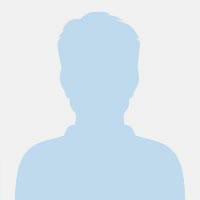 But what if illness or age means that you are no longer able to leave your own apartment without assistance? 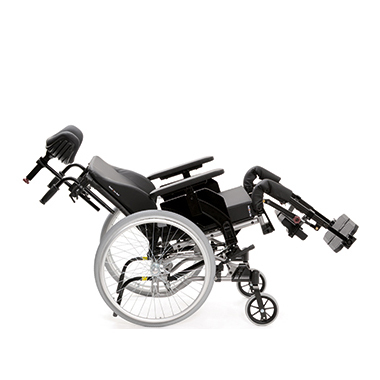 A useful helper is the e-fix electric add-on drive, which turns your wheelchair into a small and lightweight electric wheelchair. 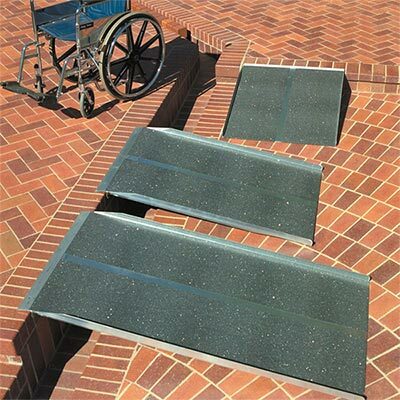 You can then independently cover greater distances and handle slopes without stress or external assistance. Being in control of our own lives for as long as possible is something all of us want. Equipment like the e-fix add-on drive can help you achieve this. Great in all circumstances, the add-on drive is a huge help in everyday life. 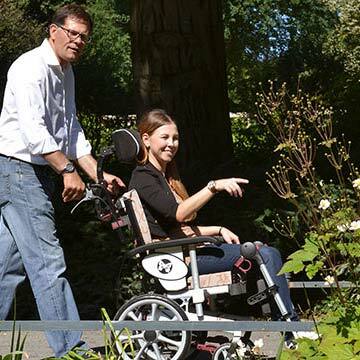 e-fix makes your wheelchair incredibly easy to control – you’ll learn to master it right away! The powerful drive wheels of the e-fix are great for outdoor use too. Walks with your partner or friends, a stroll around the town – with e-fix, you can do all this and more. The speed is set to anything between 0.5 and 6 km/h using the easy-grip controller. As a rule, the slower you drive, the swifter the wheelchair reacts. You steer, the e-fix responds! Motor, brake, gear and coupling have been integrated in the drive wheel in the wheel hub. 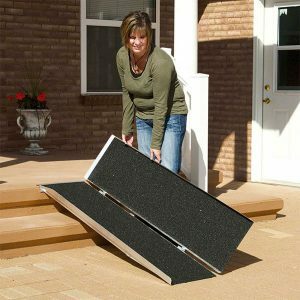 This allows the wheels to be easily fitted and removed without any tools. Wheel dimensions 22" and 24" 24"
I wouldn’t be able to get out any more without my e-fix. 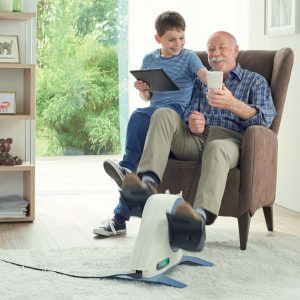 This product is available for demonstration at our MoblityCare warehouse in Oakleigh – unfortunately we cannot offer home demonstrations. To organise a demonstration, please fill out the form below and we'll get back to you shortly. To find a local dealer near you, please fill out the form below and we'll get back to you shortly. Ask your question here and we'll get back to you with an answer shortly.